How Can I Reconcile with a Husband Who Hates Me? If you are thinking “my husband hates me,” it doesn’t mean you need to apologize and become submissive. And, it doesn’t mean you need to reject him. But you do need to figure out what is going on and how to start the path back to a loving relationship with him. Your husband may seem to hate you, but if he did, he would leave. Find out what is fueling his anger. Unless he has always been angry and hateful, you are not dealing with a personality problem. His behavior is either reactive or purposeful. It’s not that he wants to hurt you, but he doesn’t know a better way to deal with his feelings or to get what he wants. Most likely he would like to have a close relationship with you, but is clueless about how to go from where you two are now, to that place. You can be the one to help him get there–for the both of you. And for the sake of your kids, too. 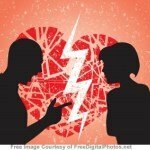 Does your husband really hate you? A man will not live with someone he hates unless he believes he has no other choice. So begin there. Is there a practical way that your husband could leave you? If there is and he is still staying with you, then it is not hate that you are dealing with, but some purposeful use of anger. For example, he may be protecting himself from what he feels is rejection or control from you. Or, he may be using his angry in order to control you in some way. If he is not able to leave you for some practical reasons, then he may blame you for his being stuck. Does it seem like he blames you for everything? Then he is actually blaming you for his unhappiness. You will need to learn how to deal with his blaming, and take away his excuses for being stuck. Although you may think it is better he feels stuck, it is not. It is actually better, if he sees that he could go, but that he is choosing to stay with you. He needs to feel that he is staying because he is choosing to, and not because he has to, if he is to be able to drop his hatred. Many men have learned to use anger as a way to get what they want. It’s a method of intimidation that probably goes back to their childhood. There are a couple of ways to know if you have such a husband. First, does he become nice again almost as soon as he gets what he wants? People who are really angry and not just manipulative, tend to stay angry for a while after they get what they want. It takes them a while to transition to warming up again–slower and slower as the relationship gets worse. Controlling people can change rather quickly. There are two major approaches to maintaining a relationship with such a man. The first is to give in to him constantly to avoid conflict. If your husband is very narcissistic, this may be your only option other than leaving him. The other option is put good boundaries into place. These will at first increase his anger and controlling behavior, as he attempts to regain control with his usual methods. But, if you can be consistent, he will eventually learn that such methods do not work with you. Then, he will either leave you or become nicer, since that will be the only way that he will get what he wants. This second choice is the best if you are not prepared to submit to your husband’s control for the rest of your life. Thankfully, most men are not stuck being controlling because of some kind of personality disorder. Like all people, they can strike out at others when they are feeling hurt by someone, or are very stressed. Some men feel too secure in their relationships. Fearing no bad outcome, they believe it is safe to be physically or emotionally abusive. They then use their wives as a kind of pressure release valve to blow off excess anger. That would not be safe for them to do at work or with someone else. Although these men often feel sorry after they behave this way, the relief they feel rewards their behavior and maintains it. You might feel inclined to excuse his hateful behavior because you know he doesn’t really mean it. If you do, it will eventually erode your relationship away to nothing. You must be prepared to show him that you are not at the bottom of the pecking order and that it is not safe to take out his frustrations on you. That will start with small boundaries such as walking away when he is verbally abusive. The boundaries can escalate to separation (moving out) if his behavior remains unchanged. Don’t use arguments rather than boundaries. Arguments actually feed the behavior and make him feel less guilty about taking out his stresses on you. Have you done something that hurt your husband? Something intentional, such as an affair, or accidentally, like backing over his cat? If so, he may not be able to forgive you, even if he wants to. To forgive means to release someone from a debt. They no longer owe you any apologies, any suffering, any explanations, or any accountability of any kind. As Christians, who have accepted Jesus’ atoning death for our sins on the cross, and asked forgiveness of God, there is not only forgiving, but there is forgetting (Hebrews 8:12). We are reconciled with God. With our spouses however, there is no forgetting. Many people cannot forgive because they don’t know how. They think that forgiving means just waiting until thoughts of vengeance and feelings of anger go away on their own. Your husband may be stuck waiting for that to happen, and occasionally act on his anger in the meantime. Continued apologies are only going to make matters worse. Your husband cannot do what he is not able to do, but you can help him. Unforgiveness normally disappears when replaced by the fear of loss. You must be able to: 1) be a very good partner for your husband; and 2) provoke his fear of losing you. Under such circumstances his feelings of love for you will soar and all will be forgiven. Remember that you can’t do step two without step one. No man is going to have his fear increase when a woman who is not a good partner leaves him. Many people become disillusioned with marriage. Not only is it less fun than they thought it would be, it seems to be a lot worse than having been single. This is particularly true for people who do not maintain a close relationship after getting married. Add to this the enticements that men face every day to be unfaithful, and a man can become pretty miserable. 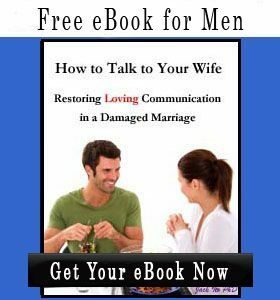 Many men remain staunchly loyal to their wives even in this circumstance, but instead of doing something to improve their relationships, they start to avoid interaction and to become grouchy or mean. Think about the marriage from your husband’s perspective. Do you think that your behavior makes him feel loved and valued? Does he feel like he is a priority over the children, your career, or your social networking? 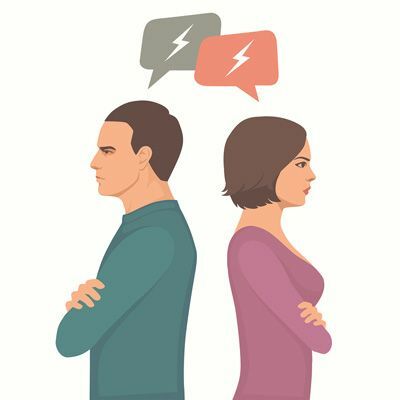 Although you can’t undo all the disconnection in one day, you can gradually start to make your marriage a positive experience for him. 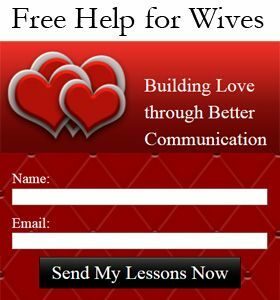 I have put together five free relationship building lessons to get you started. If he enjoys your relationship, he won’t regret being married. Men can deliberately seek out affairs–even if all of their needs are being met in their marriage. Men will have affairs if 1) they have the opportunity, and 2) they do not fear significant loss in doing so. When they start their affair seeking behavior, they typically will create emotional distance from their wives, which also helps them to get the physical distance needed to troll for women. If they fight with you enough, for example, they may be able to move to the basement where they can freely spend hours connecting with other women on the internet. Because they are not wanting to divorce, they will also sometimes connect with their wives. So the are sometimes friendly, but mostly not. These hot and cold behaviors can be very confusing for their wives. When men first start this behavior, they do not generally want to end their marriage. They just want to add to their lives some more excitement. You must be careful not to let this situation go on too long. You must use good boundaries as soon as your connection attempts start to fail. He needs to feel that if he continues on this path, that he will lose everything important to him. It will make him more angry at first, but could prevent an affair. Then, you must start building your relationship and try to put a little more excitement into it. You don’t want him to feel like he is missing out too much. Be careful not to have an open marriage with him, as these are very destructive. There are many ways to add adventure and romance to marriage without sinful and destructive behaviors. 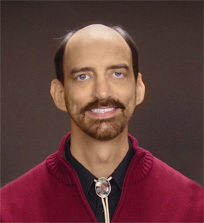 If your husband want to make your relationship better, then marriage counseling is an excellent choice. For most of the scenarios described above, he won’t want to go. But, you can still learn skills to improve your relationship with him without his participation. Agreement and empathy are necessary for ending conflict, and for helping him to relax and to feel that you are on his side. Connection skills are necessary to help him to feel important, to help him to feel attractive to you, and to foster in him more of a desire to spend time with you. Boundaries are necessary to build respect, prevent or end affairs, and stop his damaging or hostile behaviors. 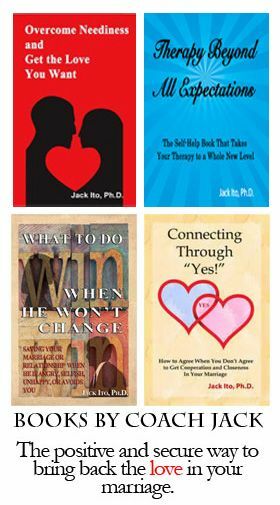 Depending on how your relationship is right now, you can start to learn some of these skills by reading books such as, “What to Do When He Won’t Change,” or you could get relationship coaching for restoring love with difficult spouses. Coaching is better when you don’t have much time, as you will be instructed what to do rather than having to figure everything out. What will not work is the be patient, or wait and see method. Fires are best put out while they are still small. Besides, wouldn’t it be nice to have a loving relationship again sooner rather than later?